It was a low pass (as you can see) and not as bright as previously, also it wasn’t as dark as I had hoped. 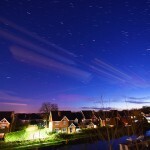 Still, fairly happy with the picture (which is a composite of over 100 pictures). Oh, and the thick stripes are clouds.